A product of the '80s, this flashy red electric guitar emanates clean chorus tones and shredding leads that go on forever. Quite literally, in fact, as the guitar includes a sustainer pickup which allows notes to ring indefinitely. While it might seem like a novelty initially, the sustainer pickup actually adds a lot of options for effects that aren't obtainable with an ordinary guitar. For example, chords can be held in conjunction with the volume pedal to create organic pad-like swells. In high-gain lead guitar sounds, the sustainer pickup sometimes causes harmonics to ring, almost like feedback from the guitar amp. We sampled all articulations with a generous length of sustain and then seamlessly looped the applicable samples using phase-coherent loop points. As you can imagine, for a guitar that specializes in showstopper lead guitar solos, we were sure to sample everything from pinch harmonics and tapping to pick slides and other performance effects. We also recorded the legato articulations with four round-robin for realistic variation when playing fast trills. 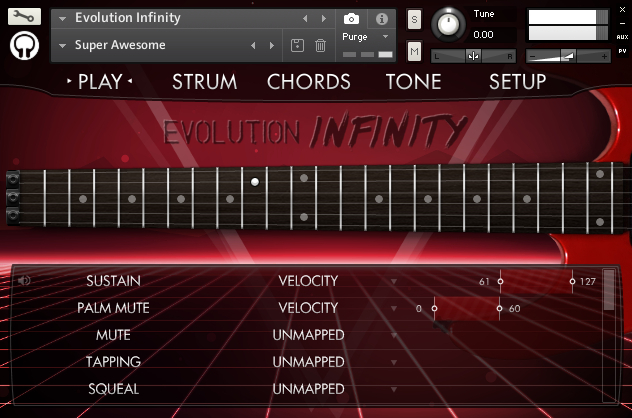 Evolution Infinity is outfitted with our Evolution guitar engine which provides you with a wealth of appointments: an innovative strumming pattern editor, automatic chord detection, and a robust effects engine. The library includes many factory presets for ready-to-use classic 80s rhythm and lead electric guitar tones that fit right into the mix. - Built-in effects engine for instantly-usable electric guitar tones. - Adjustable pick position using our proprietary physical modeling technology. - Powerful mapping system that lets you set how you want to trigger articulations, using conditions such as velocity ranges, MIDI CCs, latching and non-latching keyswitches, and more. - Multitracking up to quadruple tracking. - 5.79 GB (compressed to 3.5 GB using the lossless NCW audio format) of 24-bit samples. - Articulations such as sustains, palm mutes, mutes, natural harmonics, squeals, and tapping, plus special effects like string slaps, chugs, pick scrapes, and more. - MIDI articulations for instant octaves, grace notes, buzz trills, whole-step slides, whole-step hammer-ons, and slides (velocity-based and tempo-synced). - Legato samples for slides, hammer-ons, and pull-offs. - The articulations have 3 dynamics, 2 pick directions (when applicable), and 2x round-robin--except for the legatos, which have 4x round-robin. 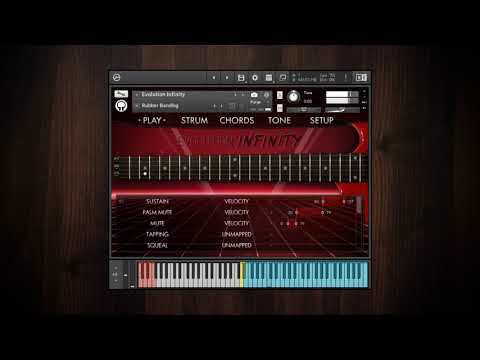 Evolution Infinity licenses Native Instruments' Kontakt Player sampler software. 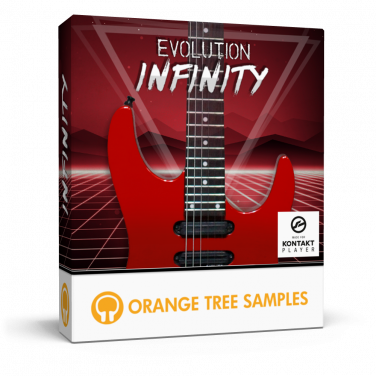 Consequently, owning the full version of Kontakt is not necessary, and Evolution Infinity operates without limitations within the free Kontakt Player application/plugin. This also allows the sample library to be listed in the libraries tab in Kontakt for convenient access. Evolution Infinity is NKS-ready. The integration with the Native Kontrol Standard presents many benefits, both when using the library in the Komplete Kontrol software as well as in conjunction with Komplete Kontrol hardware, such as the Komplete Kontrol S-Series keyboards and Maschine. In addition to Evolution Infinity being displayed in the Native Browser among your other Komplete Kontrol instruments, there are a variety of other benefits. For example, thanks to Native Instruments’ Native Map® technology, you can control the library’s various parameters directly through connected hardware right out of the box. Furthermore, the keyswitches and key ranges are shown using Light Guide, an innovative technology that displays the key colors directly on your Komplete Kontrol S-Series keyboard. We recommend using Evolution Infinity with a Komplete Kontrol S-Series keyboard for the full experience. While not a requirement, you will be able to take advantage of the Native Kontrol Standard for an intuitive connection between software instruments and hardware. This product requires a total of 7.58 GB of free disk space in order to download and install the sample library. The total size of the download is 3.76 GB, and after installed the library occupies 3.82 GB. Windows 7, 8, or 10. Mac OS X 10.10 or newer.